So this is where we part, My Friend, and you’ll run on, around the bend, gone from sight, but not from mind, new pleasures there you’ll surely find. I will go on, I’ll find the strength, life measures quality, not its length. 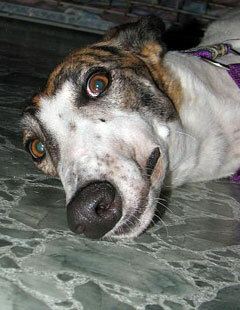 This page is a tribute to those companions who have passed across the Rainbow Bridge. Elf met up with his sister Tia yesterday at rainbow bridge.We hung on to him as long as we could.Elf was born a natural winner on June 3,2004.We had gotten Elf December3.2007.We remember it took us 15 minutes to finally get him in the house, then he freaked out on the flooring.The next week I was at wallmart buying 150 dollars worth of carpet runners.Our fondest memories are of Elf playing in the back yard with his sister Tia,egging her on like big brothers usually do.His favorite moments were visiting the carehome with his sister.They seemed inseparable and we are sure they are playing together right now. DOB Nov /5,2005 – April 28, 2014. Victor’s name was perfect for him. He was strong minded and took some time to let us fall into his heart. But just long enough for us to see how strong he was, he independent he could be and how loyal and dedicated he was to us. We playfully called him “Cry Baby” because he was always whining and called him “Poopy” because he would back up to a bush and do his business in the grass. He had a special little dance that we loved. He was a very well behaved boy who taught our new grey “the ropes”. Now she is missing him so much. It saddens us to loose Victor to cancer but know that his life with us enrich ours and made us smile. He loved our cat Yoshi in a standoff way that made us smile. He was a protector and I loved the soft spot under his belly. We will miss his howling in the middle of the night as he dreamed of good things (we hoped). Run with Ditto, Victor and as before, try to keep up! Rocco came to us in August of 2011 because his forever home was lost after his owner died and he was placed back into rescue. He was a sad, old dog when he came to us. We worked hard and hopefully brought some joy to his life during the short time we had him. He had the softest fur, and loved to have neck and ear scritches. He was weak in the back end and would lay on the dog bed by my feet every evening trying valiantly to “roach”. Ultimately his chest would be turned up while his legs stayed put to the side. A few chest rubs later he would sigh and lay stretched out on his side. It took a long time for him to warm up to us but he did…and came for pats and cookies along with the rest of the pack. It was a hard decision to let him go to the Bridge. His breathing became labored and he would wake up gasping for breath. Even going out to the yard caused him to gasp. Saturday May 18th, 2013 we lovingly released his spirit to run free. 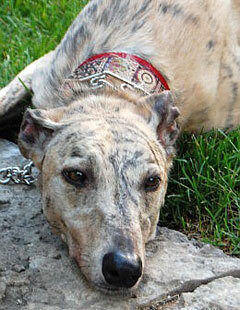 Our beautiful boy Tai (Boc’s Upondatail) crossed the rainbow bridge on Sunday Aug. 5, 2012. Tai was born December 8th, 2004. 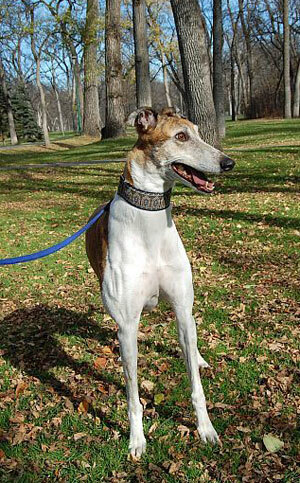 He raced in Wisconsin and was brought to Winnipeg by Hi-Speed Hounds in 2007. He was only 7 years old. Tai suffered a massive stroke to his brain brought on by Immune Mediated Thrombocytopenia, which is a reduction in platelets (thrombocytes). IMT may be secondary to some other process (such as an infection, tumour, or drug reaction) or it may be primary, meaning that no other causative factor can be found. 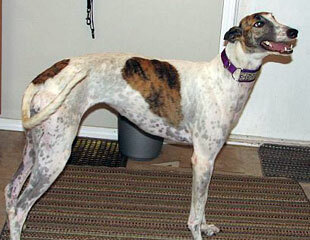 It is more common in certain breeds, suggesting there is an inherited component. IMT may occur by itself or with other conditions like systemic lupus erythematosus and autoimmune hemolytic anemia. The direct cause remains uncertain in Tai. However blood work ruled out poison. 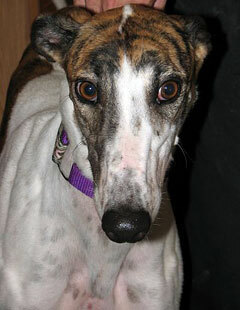 That was a tremendous relief as we have other dogs. Tai did have a Tick removed a few months ago, and had an infection on one of his hind leg paw pads. We showed up at the HSH BBQ recently with him wearing a sock on that leg! The paw pad healed up and was fine. Tai never showed a sign of illness. If his system was compromised or failing, we were unaware. He was happy, his appetite was great, he wanted to go for walks, and he never refused a meal. Tai always smiled when greeting us! He was a tremendously strong but gentle giant – 31″ at his shoulders and at his prime weighed 92 lbs. He loved his people: Dan, Julia and Melynda. 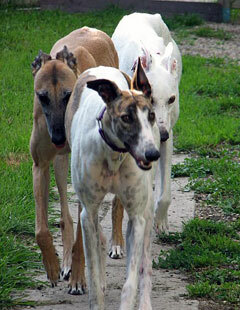 He also loved his “pack”: Chloe, Guinness, Kitty, and his sweetie, Rainy. 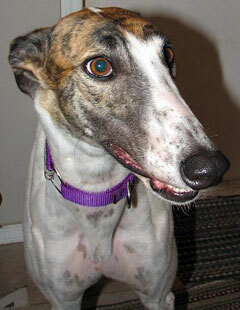 He enjoyed going to “Meet and Greets” for Hi-Speed Hounds. His absolute favorite things in the world were mooching toast in the morning, demanding belly rubs, watching TV on the couch, snuggling his “GuinniBear” and best of all, going for walks with Julia. We are in a daze trying to comprehend all of this but in the end it was just his time to leave. He has left us as fast as he raced into our lives and hearts. Thank you to everyone in this GREYT organization for all you do. We love you guys. 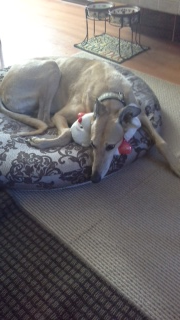 Cuddles came to us in her golden years after being dumped off at a pound. A sweet little fawn girl, the only obvious problem she had was her teeth. Michaela’s priority was to get her health up to where she would at least be able to have a dental. 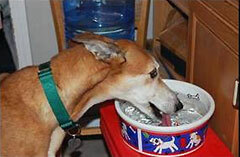 Three of our wonderful Greyhound people even offered to take her home, to at least live out the rest of her days, months, or years – knowing that she was truly loved and wanted. 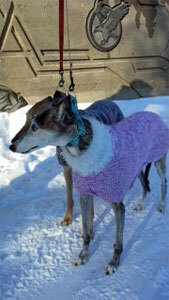 Our consolation was that she WAS loved and surrounded (if only by spirit) by many wonderful Hi-Speed Hounds people. At least she was able to cross over, knowing that yes, someone did care. Thank you to those of you who prayed, donated towards her vet bill, and were willing to open their homes and hearts for this sweet little girl. For all the ones we are able to save, it still hurts terribly to know that sometimes one just slips through our fingers. February 2012. 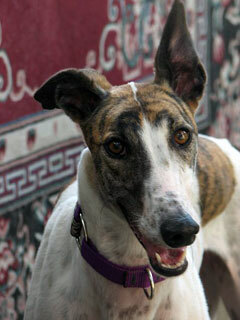 HSH lost a great Retired Racer when Speedy left us. Any one who met this “Coyote Hound” must have wondered what the coyote thought when this tiger striped bolt of lightning came flying at him. He was a really sweet dog, loved by all. In the summer of 2006 we received an incredible gift. He would take us out for daily walks, he would take us out to spend time in the park. He showed us how neat it was to go for car rides and he even taught us how to really enjoy a good Ice cream cone. “First you lick the ice cream up quickly then you slowly but gently eat the remainder of the cone.” Parker you changed us and our lives the moment we meet you. You became my mate , my shadow, my beautiful boy. On the morning of Friday August 5th, 2011 our incredible gift would have to leave us for now. We miss your face in the window when we pull in the driveway, we miss your tail wagging when we say “where’s your collar,” we miss you in the yard when we walk out the door…We miss you! 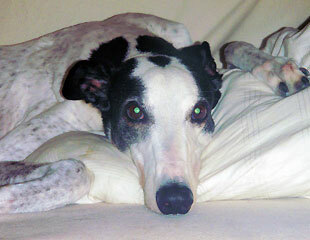 Parker you were a beautiful, gentle, quiet boy who was called away too soon. It broke our hearts and took all our strength to let you go that day, just to imagine you running free, happy and at peace again would make all our sadness worthwhile. Not a day has gone by without your name being spoken, not a day has gone by without a tear being shed . To Dr. McQuade, Dr. Gould and staff at Best Friends Animal Hospital, Thank you for your compassion and care during Parker’s five year journey with us. To Michaela, You are an incredible lady who brought us companionship, loyalty , unconditional love and unfortunately unbelievable heartbreak from the most unlikely of places. 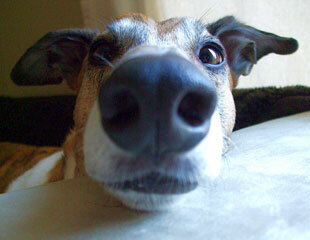 Greyhounds truly are amazing creatures. Please never stop what you are doing. Parker you found your way to us once, we believe you will do it again. Until then, you will always be mummy’s best boy. 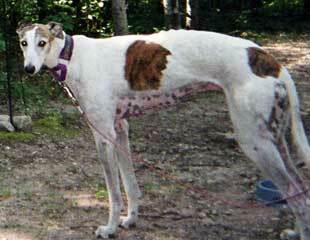 Suddenly and unexpectedly on a warm June evening, Glister made her way to the Rainbow Bridge. 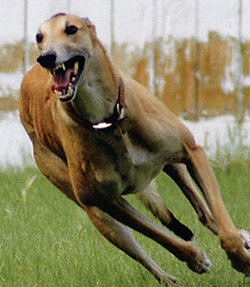 She came to us through Hi Speed Hounds after a track life of approximately 4 plus years, racing into our hearts at the speed of light and leaving a 58lb, greyhound shaped hole when she left. 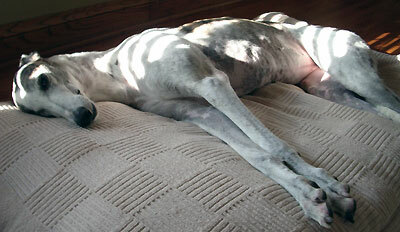 She was our first Grey and suffered through all my efforts at ownership with grace and patience. We learned from each other by trial and error. Hers, don’t ever growl at the schnauzer. Mine, don’t ever put a down comforter in her crate (you may assume the outcome). 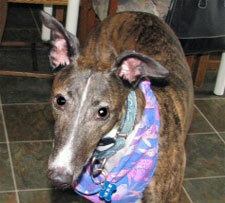 Her ESP was uncanny…she could detect a Zeller’s bag with a box of Milk-Bones from 75 feet. THINK cookie or walk and she was off of her pillow. Spending any length of time in the bathroom with water running was a sure sign we were going OUT and would bring screams (and I do mean screams) of delight from the other side of the door. Bruce’s nick name for her was # 6…you know , when you buy some clothing and find a little piece of paper in a pocket stating “inspected by #6″?… no purse, shopping bag or back pack was safe. Strangers would stop to pet her and any open bag was an open invitation. She never took anything… just checking. Getting groceries into the house on a rainy day required as much calculation and stealth as the U.S. forces used in raiding Bin Laden’s compound. An expressive girl, her communication skills were well practiced. She lost an eye to a fast growing tumor a few years ago but that made little difference. Many moods could be detected in that lone orb. Gold Metal Stink Eye! With just a tip of her head and a repositioning of the ears she would make her needs known. A true princess. Not the most social dog, preferring to be at home with me and her canine buddies. She loved her walks, car rides and being at the lake. Songs and belly rubs after breakfast EVERY morning. Acted like the fun police if her grey brother got carried away. Guarded her yard with a bark unfitting a lady. Best corn-on-the-cob eater EVER! Hi Speed Hounds Calendar Girl two years in a row. 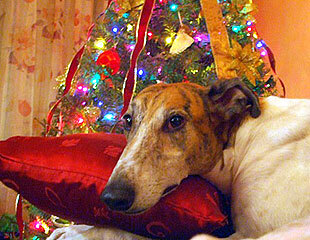 On March 26 2011, Hokie the official ‘test cat’ of Hi Speed Hounds went on to the rainbow bridge with his family by his side. 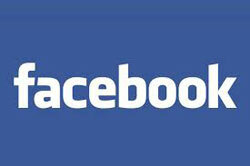 He had been living with cancer since November 2010. Despite his terminal illness, he continued to live out his remaining days with his fabulous personality intact. 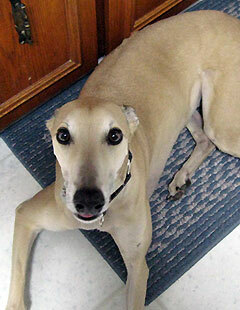 He entered our dog-loving home in 2007 and quickly found a place in our hearts. 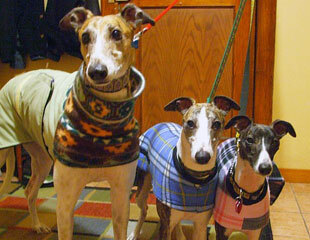 He shared his home willingly with two greyhounds and a hamster as well as with a host of greyhound fosters. He took on his cat testing role within Hi Speed Hounds in stride and seemed to welcome the opportunity to check out all the new greys. He has left an immense hole in our home and our hearts and we will miss him terribly. Our beloved Missy came into our lives and hearts on May 6th, 2006. We like to say that she picked us. 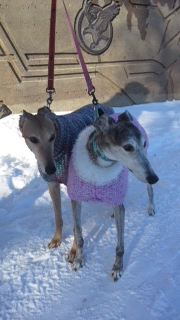 We sat in Michaela’s yard that Saturday afternoon, with our Carley, watching the Greyhounds running about and socializing. 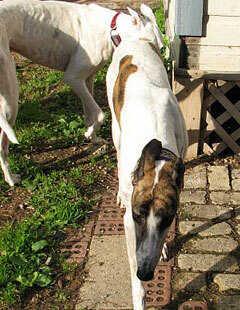 We could see Missy coming closer and getting braver with each lap she made of the yard. Finally, she was up on the deck with us and trying to get up the nerve to come closer. We eventually took her home that day to “socialize” her. 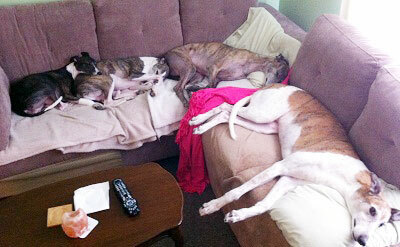 We had absolutely no intention of adopting another greyhound at that point! Missy was what is known as a spook. 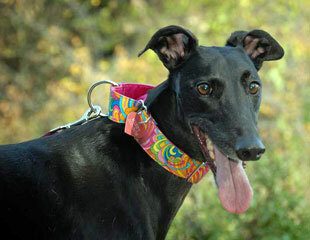 A spook is a greyhound that, either because of genetics or abuse, cannot handle stress or anxiety appropriately. It was very stressful for her to come and live with us. 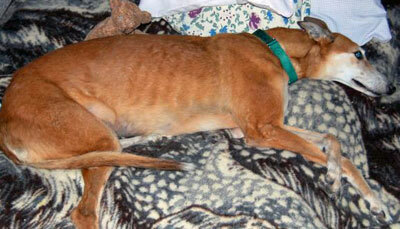 I’m sure many potential adopters remember looking into Michaela’s bedroom and seeing Missy “hiding” on her bed. She did the same thing in our house. If the doorbell rang, she was gone! We could be sure to find her laying “safely” on our bed. It took her a long time to adjust to us and by then we just knew we couldn’t give her back. Missy (our black beauty) absolutely adored having her feet rubbed. She would lay beside me and as soon as I stopped rubbing she would hit me to let me know I should continue the rubbing. Her beautiful face with the big soft eyes were evident in every picture we’ve ever seen of her. It was so exciting to see her true personality emerge and she was just starting to come into her own when we lost her. 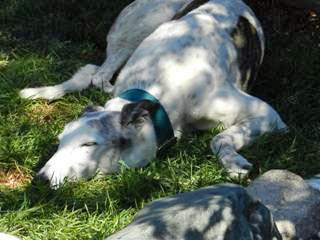 Words alone cannot express our heartfelt gratitude to our Greyt friends for all the love and support we have received after her loss. 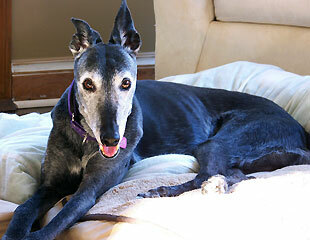 Even though we still have two beautiful Greys, our house feels empty and our hearts are broken. We were truly blessed to have been owned by Missy. I found a very beautiful poem that gives me Greyt comfort. I’d like to share the last verse with you (especially those of you that have lost your own grey). and moonbeams dance around me, as stardust falls on thee. have no fear of loneliness – for here you know I wait. My precious, precious, Moe. The only thing fearsome about you was your mighty size, but in fact you were the most gentle giant. 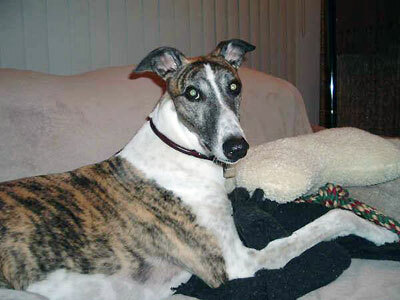 You were the largest Greyhound I have ever met, but it was your incredible gentleness and sweetness that everyone was drawn to. From the second I laid eyes on you that cold Wisconsin morning, I was in love. You reached out of the open hatch of the Explorer, and gave everyone kisses. 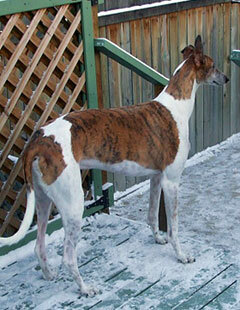 Your beauty and quiet demeanor caused so many people to fall in love with this breed, a breed that was still virtually unknown in Winnipeg at the time. 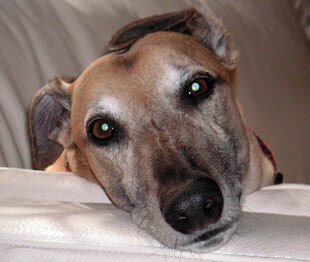 You leave behind a huge legacy of so many Greyhounds saved. We had seven wonderful years together; and I was so incredibly blessed to have you. Yours was the presence at every meet and greet and event, and you were so gracious to everyone, from children running up to you and giving you hugs, to the elderly at Holy Family Nursing Home, reaching out to pet you from their wheelchairs. You stood patiently while people asked so many questions and just wanted to admire your beauty and grace. It is easy to see why this was the breed of choice of pharaohs and kings. To see your picture on Rainbow Bridge, just does not seem real. Words cannot express the devastation your passing has caused. We were an inseparable pack, and now there is an unspeakable void. Hal is lost without you; after all, you were best buddies. He still looks for you. I was so very protective of you, yet you were only borrowed to me for a time, and I had to let you go when the angels came to take you home. I know you are safe, and I am so glad that Carebear has his big brother to take care of him. Fly free my beautiful boy, till we meet again at the foot of the Bridge. Death is not the extinguishing of the light… it is the putting out of the lamp because the dawn has come. In the 6 months you were with me, you changed my life forever. I fought hard to take you from a bad situation, and didn’t know what to expect when you came home with me on that spring day. It didn’t take long before you stole everyone’s heart. I always loved the big boys, but all 64 pounds of you changed that in a heartbeat.. You were such a clown and a goof, everyone that met you fell in love with you. As I got to know you, I saw your incredible spirit. You were so joyful, CareBear, when you were with your adopted brothers. They accepted you from the get go, and soon learned to love you too. You embodied such happiness and loved life so much. You adored car rides taking in all the sights, and Vince Leah was your favorite place in the whole world. You couldn’t wait to get out of the truck and run. You made yourself at home on the couch, and loved to snuggle under the covers. You had the most beautiful expressive eyes, and what I saw in them was pure gratitude. When Moe crossed the Bridge, I hung onto you for dear life, only to lose you less than four weeks later. I had to make one of the hardest decisions of my life, when I found out you would never be well, and would only suffer..I know you and Moe are together, and that you are safe with your big brother taking care of you, and that does give me a measure of comfort..When my work here is done, we will all be reunited again, and you will do that silly happy dance that endeared you to me so much.I will always love you CareBear, and I am so grateful that I had the chance to know you, and to be your forever mom.. I will meet you at the Bridge my sweet boy. 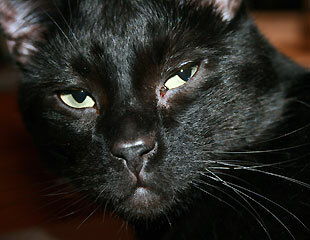 Drew came into our lives in August 2006. He quickly made his way into our hearts with his gentle nature and mischievous spirit. We learned he loved to counter surf and nothing could stop him, even a muzzle. He never raised a lip or took chase to our cat, and he loved to be petted by children on our walks. He always had a friendly wag in his tail, and often an excited chatter of his teeth. Drew was a good boy, even if he got into things he shouldn’t have in our absence. I remember coming up from the basement to find the garbage can lid around his neck and an innocent look on his face. Just a few of the ‘treats’ he took while we were out include: a pound of hamburger, a loaf of bread every now and then, shoe polish (all natural and the vet said it would go through him; it did, and I found bits of the sponge applicator all over the yard in the spring…), and coffee was his favorite, weather it be ground, beans or from my cup while I was out of the room. Drew was very loving and enjoyed being around people and other pets. He followed us around the house and slept at the foot of our bed every night. We believe he was a small dog trapped in a big dog’s body; he befriended two Lhasas while at the kennel during vacation, and always had fun with the ‘toy’ dogs at the groomer’s. People often stopped us while out for walks for a pat on the head or an ear scratch, and often commented he looked like a dear from afar. His love for children was proved when we brought our daughter Sophia home in September 2009. The first time he heard her cry, he cried with her. He was protective of her too, whenever someone other than us held her, he kept close to her. As she started to crawl around, the first place she went to was his bed, and he lovingly let her busy little fingers find his ears and toes. It was with great surprise and sadness that we learned Drew had bone cancer. He left our lives quietly with us by his side that June morning. He will forever be in our hearts and on our minds. We have been so blessed to have had a friend like Drew. We picked up Justice that March morning, and within minutes we knew we had an incredibly special boy. Not satisfied to sit in the back of my Jeep with the other new Greys, he crawled into my lap where he nestled his head into my arm and promptly fell asleep. It didn’t take long before he melted all of our hearts. Justice was incredibly jealous of any other Grey who dared to sneak in for affection, and was very protective of his toys as well. 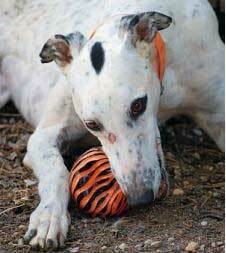 I will never forget the day he saw Anton take a toy into his kennel, and Justice flew across the room not only to rescue his toy, but to make sure Anton, or any of the other Greys, would never do that again. Yes, this boy was a challenge, but he was so smart and so sweet, that even though he kept us on our toes, one look from those liquid eyes and all was forgiven. Justice loved people, but his love for children was really special. Never have I met a Grey who adored young children like Justice did, many times enjoying a game of tag through the fence with our neighbors kids, always so gentle when he reached up to kiss them. The seven months I had with my Justice man were certainly never boring, and the day he left for his forever home in Ontario was bittersweet indeed. As I watched the Escalade pull away, I would never have imagined that would be the last time I would ever see my boy. When I got the call, I could not believe it. Justice had felt unwell that morning, and was acting strange. Upon getting to the vet’s he collapsed and had to be carried in. He had bled out into his pelvis and abdomen, losing his platelets and blood pressure. He could not recover. Another young life felled by tick-borne illness. You were my heart dog, Justice, such a little man, with a huge heart and even bigger personality. Your passing has left an undeniable void. You are greatly missed. your silly smile. Mom loves you…always. 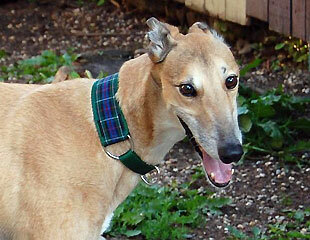 Ringo (Ringo Ron) was a fun loving boy who loved to run. 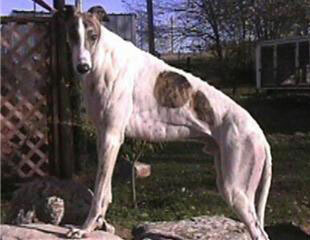 Born on March 20, 1999, he ran 137 races at Bluffs Run in Iowa. 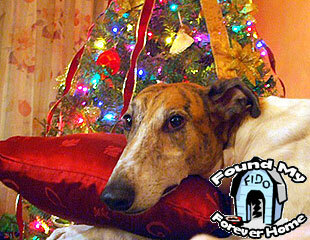 He retired in 2003 and was adopted from Wind Chimes Greyhound Rescue in January of 2004. Sadly, after a brief illness, he crossed the Rainbow Bridge far too soon. is done. Run my beautiful girl, but wait for me by the bridge and we’ll cross together.